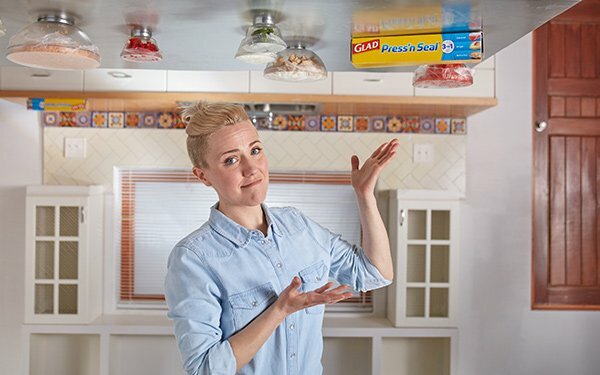 Glad Products has unveiled a zany new video done in collaboration with influencer and YouTube creator Hannah Hart to demonstrate the clinginess of its Press’n Seal food wrap product. The video, titled, “The Upside Down Cooking Challenge,” (and created by Portal A) features Hart suspended upside down at a cooking table suspended from a ceiling and also upside down. Hart’s task is to assemble (no real cooking involved) a burrito in that position using ingredients contained in bowls affixed to the table with magnets and covered with Press’n Seal. Glad Products is part of Clorox, which is earmarking more of its marketing budget for content creation with influencers. In May, for example, Pine-Sol partnered with Ianna Sarkis to launch the “My Clean Moves” contest that asked people to show their cleaning dance for a chance to win $5,000.